Milo Servicesms provides services throughout all the different areas of Western Pennsylvania. Do not worry because our restoration technicians are more than happy to serve you. Our damage restoration company strives to provide our clients with affordable and reliable restoration and cleanup. We specialize in water, fire, wind, and flood damage. And because we know how important it is for Pennsylvania homeowners to have fast and reliable restoration services, we offer a variety of remediation. From water damage cleanup, basement flooding, wind damage, storm damage, and fire damage restoration services as well as all repairs to your home. You can rely on our carpet restorers to get your luxury rugs back to its original appearance. You name the service you need and we are more than happy to make your home a thing of beauty again! 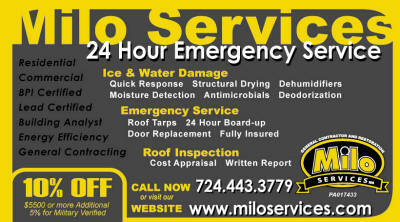 Milo Servicesms strives to provide our clients with affordable and reliable damage restoration services. If you or a family/friend are in need of professional restoration, then you need to contact the expert restorers at Milo Servicesms. Best of all, not only can you depend on us even in times of emergency, we also offer a free advice on all services rendered. Call Toll Free 877-690-4178/724-443-3779 or Fax 724-449-8079 or e-mail to get started repairing your property. "From Start to Finish we're a service you can depend on!" By utilizing the best technology for water extraction, we are able to offer a safe and fast drying process that you will be happy with. Aside from water damage restoration and cleanup, we also offer mold removal & inspection services for your residential or commercial property. We look forward to serving you and providing you with the most professional restoration services in Washington. Trust the damage restoration professionals or restorers at Milo Servicesms for disaster cleanup services, including water, wind, and fire damage, as well as mold inspection and removal. Contact us today to set up an appointment.